Drawing on prodigious personal research and a wealth of supporting materials, Professor Stevens Curl traces the effects of the Modernist revolution in architecture from 1918 to the present, arguing that, with each passing year, so-called 'iconic' architecture by supposed 'star' architects has become more bizarre, unsettling, and expensive, ignoring established contexts and proving to be stratospherically remote from the aspirations and needs of humanity. In the élite world of contemporary architecture, form increasingly follows finance, and in a society in which the 'haves' have more, and the 'have-nots' are ever more marginalized, he warns that contemporary architecture continues to stack up huge potential problems for the future, as housing costs spiral out of control, resources are squandered on architectural bling, and society fractures. ‘It is one thing to loathe what modernist architects and planners have done to our cities, and another to understand why they did it. This book digs down to the unsavory roots of the Modernist movement. It finds a mixture of pseudo-moralism, cosying to high finance, contempt for the past, for spiritual and aesthetic values, and for the humans compelled to live with its ideals. In short, the whole movement is as rotten as the Grenfell Tower of recent (2017) and tragic memory. Curl rightly calls it a ‘catastrophe’. Whereas the arts and music of Modernism are a choice, to be ignored at will, avoiding its architecture is impossible. The destruction of the urban fabric touches everyone; the necessity of living in such towers touches those unable to object, except by vandalizing them. The one bright side (except financially) is that many Modernist buildings are being demolished. But the damage done by destroying older buildings and urban areas that could have been renovated is irreversible. Curl’s own demolition begins, surprisingly, with Ruskin and Pugin, who promoted neo-Gothic as the only morally acceptable style. ‘This moral disapprobation to justify an aesthetic stance has been a dangerous weapon in the hands of International Modernists…’ (p 20). Some Modernists boasted its clean break with the past. Others, like Sir Nicolaus Pevsner, whose Buildings of Britain has endeared him to every amateur of architecture, created a false genealogy for it. This pretended that it started with the German enthusiasm for English domestic architecture and for late 19th-century architects such as Voysey, Baillie Scott, and the Arts & Crafts movement. Curl’s second chapter, ‘Makers of mythologies and false analogies’, shows that the products of this period have almost nothing to do with Modernism as it appeared after World War I.
Philip Johnson, Alfred Barr, and New York’s Museum of Modern Art dominate Chapter 5. Curl sees the effect of German émigrés fleeing Nazism as far from benign. Although Modernism’s Teutonic beginnings were now downplayed, a close examination of them ‘induces a deep sense of unease: there can be no doubting the unfeeling authoritarianism, even totalitarianism, at the dark, irreligious heart of Modernism, something that generally has been ignored.’ (p 182) None better fitted this mindset than the Swiss-born ‘Le Corbusier’, perhaps the chief villain of Curl’s history. His simplistic slogans, his ‘propaganda manual for destroying humane architecture and coherent, civilized urban structures’ (p 194), and his ‘monstrous egotism…and infatuation with unsustainable consumerism’ (p 198) lead to another major theme of this book. That theme is the ‘strange survival’ of the Modernist movement: in brief, that ‘it was intimately linked with commerce, with planned obsolescence, and with vast financial and industrial concerns, without which it could never have been so universally embraced.’ (p 222) After 1945 it posed as the moral alternative to the Nazis’ grandiose ‘stripped Classical’ buildings. Ironically, it was countries like Poland and Germany itself, which had suffered most destruction in the Second World War, that rebuilt their city centres in traditional style. In the succeeding chapters, Curl illustrates the consequences of the Modernist hegemony, as he had done on a smaller scale with his early book The Erosion of Oxford (1977). Oxford has survived, but more workaday cities like Coventry, Birmingham, Glasgow, and the City of London have not. Curl does not mince words: ‘A colossal crime has been committed against humanity and common sense’, and, quoting Charles Jencks, ‘half of Europe was destroyed due to the alliance of the [Corbusian] dream of Mass Culture and greed.’ (p 302) He is equally unsparing of ‘Deconstructionist’ displays by ‘star architects’ like Gehry and Hadid, which play on the public disaffection with rectilinear Modernism. Some evidently find London’s new towers, the Gherkin, the Shard, the Cheese-grater, and the Walkie-talkie, exciting and cool, if not ‘camp’. This could only happen when high culture, meaning that ‘autonomous reality in which ideas, aesthetic values, and works of art and literature connect with the rest of social existence,’ (p 341, paraphrasing Vargas Llosa) is rated no better than popular or mass culture, which rests on spectacle, image, propaganda, and commercialism. And it is cold comfort to those condemned to life in ‘bog-standard’ flats. The Modernist rejection of ornament deliberately excludes meaning, symbolism, and the religious dimension, frequently mentioned in the book. But as Curl admits, ‘All monotheistic religions are essentially intolerant’ (p 315). How can one have the spiritual benefits of religion (and the art and architecture that it has always inspired) without the downsides of fanaticism, fundamentalism, and superstition? This question hovers over Curl’s ‘Further reflections’, and it has to be answered before any real remedy can be undertaken. Indefatigable in his ninth decade, Professor Curl has penned a magisterial tour de force that exposes the conceits and folly of architectural Modernism. It exhibits the work of a scholar at the height of his perceptive powers and provides a penetrating and judicious interrogation into one of the greatest shams in the history of architecture. Having already made outstanding contributions in many unexplored tributaries ranging from Freemasonry to Egyptian Revivalism, Curl turns his discerning gaze to what he duly calls a ‘Catastrophe’ in contemporary architecture and design. This indispensable volume highlights the numerous misconceptions about the Modern Movement and illustrates the gross fallacies perpetuated by CIAM and Corbusianity. But make no mistake, this is no mere revisionist account of twentieth-century architecture; it is a surgical takedown of the juggernaut of Modernism and unmasks its baleful manifestations on streets as far as Milwaukee to Brasília while providing dire warnings about the growth and health of our cities and townships. Curl opens our eyes to the cult-like fundamentalism of the Modern Movement and the blind devotion accorded to its chief propagandists, namely Gropius, Mies, and Le Corbusier, who we discover was a self-promoting Fascist ideologue with a puritanical obsession concerning personal hygiene. The myth that the Athens Charter would engender an egalitarian utopia and offer a panacea for the ills of twentieth-century urbanism is closely examined and demolished by Curl, whose unsurpassed combination of wit and erudition shines through on every page. Every subject in this cornucopia of scholarship is scrutinised with superb fluency and élan. Curl’s brilliant text is a timely marvel, and nothing previously published comes anywhere close to this careful dissection of a century of deceit and destruction. The reader will be completely engrossed with the author’s masterful command of primary sources and sage insights about the life and works of neglected figures, including Baillie Scott, C.F.A. Voysey, and Erich Mendelsohn. This is not a work to be read passively but instead must be mined as a vast repository of rich cultural learning about the failures and hubris of modern architectural education, theory, and design. 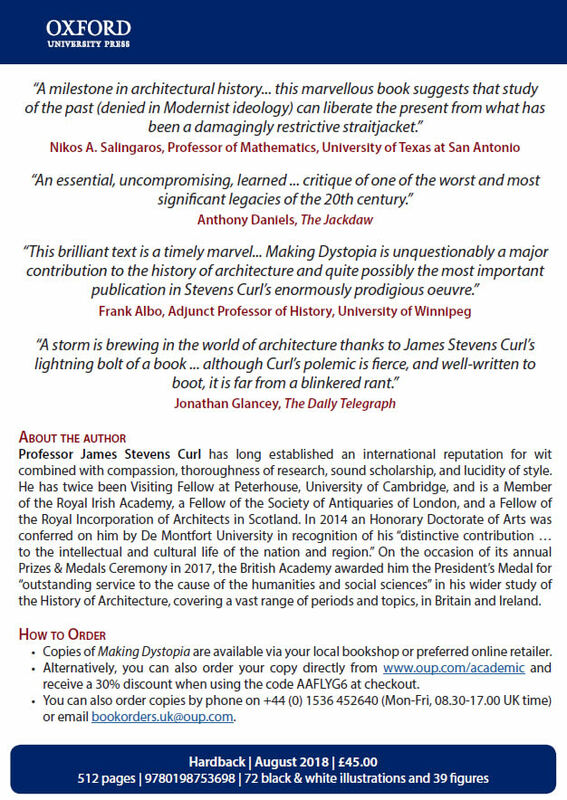 With this invaluable study, Curl solidifies his place as the nonpareil among scholars unafraid to challenge received opinion and the ‘almost Mosaic authority’ of luminaries such as Pevsner, Ruskin, and Philip Johnson. 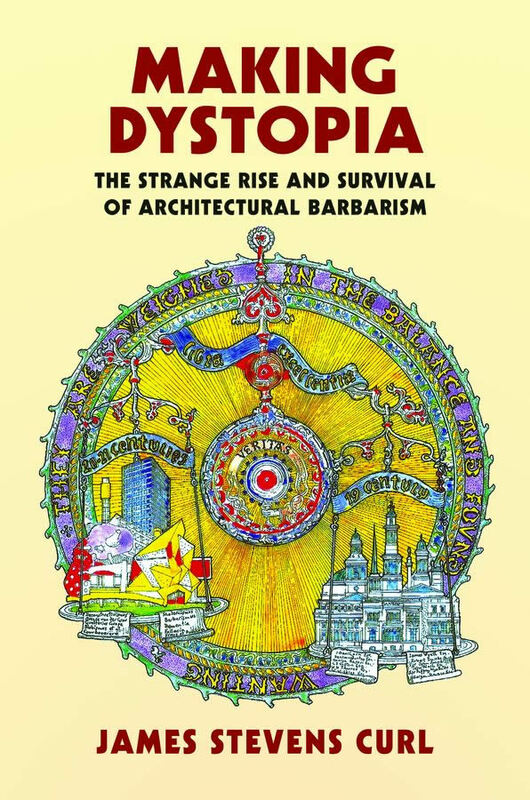 Dystopia is unquestionably a major contribution to the history of architecture and quite possibly the most important publication in Curl’s enormously prodigious oeuvre. 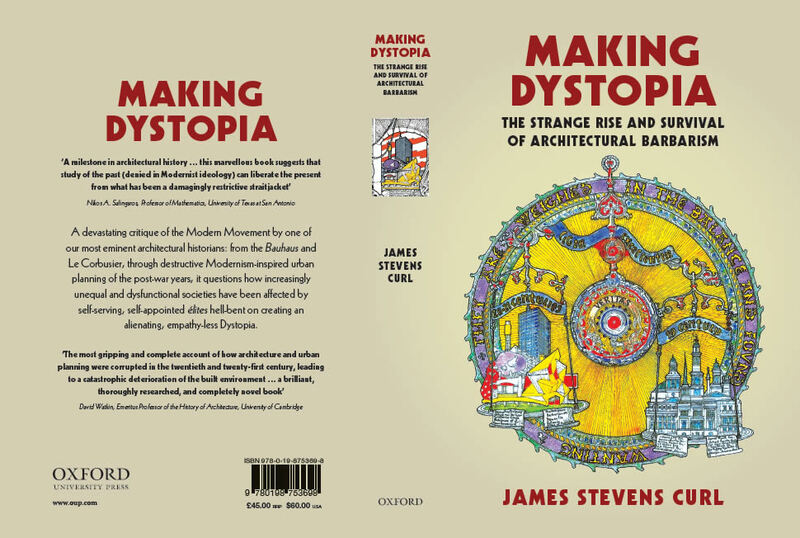 Making Dystopia, the most gripping and complete account of how architecture and urban planning were corrupted in the 20th and 21st century leading to a catastrophic deterioration of the built environment, is a brilliant, thoroughly researched, and completely novel book. It is full of information about architects and buildings which will be unfamiliar to many readers, and at the same time has a topical theme in that it is fired throughout by a convincing onslaught on the devastation of countless towns and cities by architects whose buildings are analysed in chapters with titles such as 'Dangerous Signals' and 'Descent to Deformity'. It records that a great British architect, Sir Edwin Lutyens, foresaw this decline when he wrote that 'the experience of 3000 years of man's creative work cannot be disregarded unless we are prepared for disaster,' and points to the damage caused by 'the obliteration of history’ that is ‘high on the agenda of Modernist architects'. Much of the blame for this can be placed on the absurdly narrow, wrong-headed, biased, but unaccountably influential rhetoric of Nikolaus Pevsner. 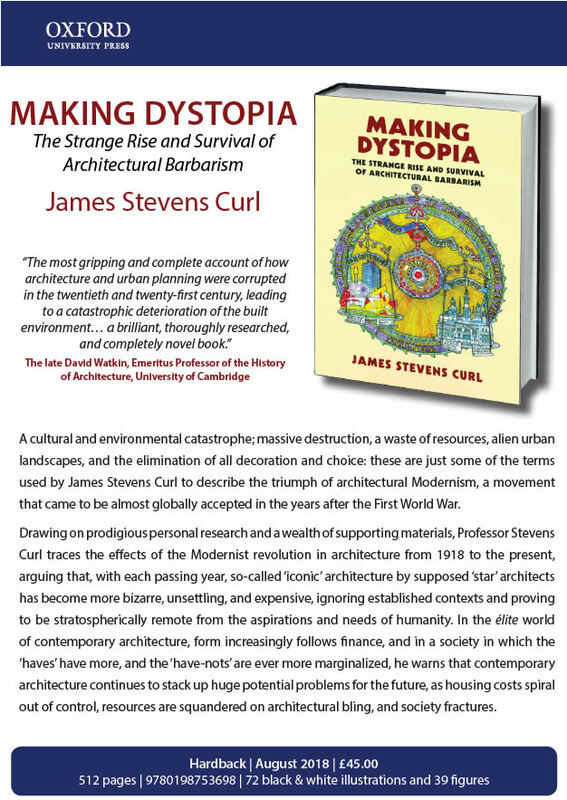 This book, surely the greatest of the many written by Professor Stevens Curl, should be read by staff and students in all schools of architecture who are still pursuing destructive, irrelevant, outdated paths, as well as by everyone concerned about the erosion of civilisation itself. The late David Watkin was Emeritus Professor of the History of Architecture at the University of Cambridge, and an Honorary Fellow of the Royal Institute of British Architects.